The fully renovated luxury is villa situated on Balaia Golf Village, which is a deluxe low-rise complex with superb gardens, golf course, driving range, 7 large pools, 4 children's pools, tennis courts, restaurant, gym, indoor pool and children's club. There is free high speed (5mb) WiFi internet available in the villa and around the pool area. The complex is less than 10 mins walk from a beautiful safe, sandy beach and within easy walking distance of over 100 bars and restaurants so you can relax on your holiday as there is no need to have a car. It is located just 2 miles outside Albufeira old town (about 6 euros in a taxi). The villa is situated only 20m from the main pool area, bar, restaurant and tennis courts. The villa has a large private garden and large roof terrace and there is plenty of shade in the garden and around the pool area. The Villa has a 50 inch tv in the lounge and 32 inch TV in the main bedroom, with cable TV so it gets over 85 channels (including BBC1 , 2 , 3 , CNNC, CBeebies, All ITV channels, Channel 4 & 5, Sky Sports 1,2,3,4, Sky Atlantic, Film 4, Nickelodeon, Disney Channel ,Cartoon Network and many more - contact me for a full list of channels , including Dutch and German channels). The Villa is only a short flight away (to Faro) and the airport transfer is just 30 minutes (we can organize a private transfer for 32 Euros for four people or 42 Euros for up to eight). A Cot and high chair is available free of charge. The nearest mini supermarket is just 2 minutes walk away. There is a regular bus service just outside the main entrance to the complex , plus Balaia offer a free shuttle bus into Albufeira old town twice a day. We bought the villa in 2002 as a place to bring our young children for holidays. It has been a perfect holiday villa - and we now bring the grand children ! We loved the fact that when we get to the villa there is no need for a car , so we can just relax. The villa is on a peaceful complex with fantastic grounds , yet everything is in walking distance, including the beautiful beach, golf course and hundreds of bars and restaurant's. We also loved the fact that it is on a complex , where there are kids clubs and kids activities and the children can easily make friends in the clubs or just in the pool. One of the only holiday complexes in the Algarve that has a golf course (and driving range) , yet is within walking distance of the beach and nightlife. En-suite bathroom in master bedroom has large glass 'two person' shower, sink and WC. Main bathroom has a large two person bath, with shower over the bath, sink and WC. There is also a separate toilet with sink off the entrance hall. Available around the pool and bar area and in the villa. 50 Euros for unlimited access for up to 5 devices for a week. Or you can pay by the hour. Large modern lounge with leather furniture, stereo CD player, cable TV (with all BBC channels plus Sky Sport and Sky Movies) and large patio doors onto the large rear patio (with views towards the main pool). Separate dining room has a large marble table. There is a large fridge and a separate freezer. Modern open plan kitchen with granite worktops, breakfast bar, ceramic hob, oven, microwave, large fridge and seperate freezer. Over 85 channels (including all the UK channels) via cable TV. The villa is situated on Balaia Golf Village, which has one of the best 9 hole golf courses in the Algarve. Full details of the holes and prices can be found at the complex website. There are also at least ten other full championship courses within easy reach of the villa - including the 5 courses at Villamoura which is only 15 minutes drive away. The reception at Balaia will be happy to book other courses for you and can get you a discount off the green fees. The villa is all on 1 level and the main pool area can be accessed either down 3 steps, or without steps by walking a bit further round. The villa is suitable for guests in a whelchair. Notes on accommodation: The villa and complex is ideal for families, as the garden and pool areas are safe and have plenty of shade, plus it is only a short walk to the beautiful safe, sandy beach (the beach bar/restaurant is also a superb place for evening family meals - or a family BBQ). Other benefits for families with children include: Safe enclosed garden (with gates on all exits and a gate at the bottom of the stairs to the roof terrace). Free use of a Cot, High Chair and fold away pram. Plenty of beach toys, buckets, spades, and floats for the pool, plus brollies and wind break for the beach. Plenty of shade in the garden and around the pool area. Shallow toddler pool. A small playground - with swing, slide and sand pit. On-side Childrens Club (local charge applies). Though we do not have air conditioning, we have fans in all the bedrooms, plus all windows have steel shutters or grills, so windows can be safely left open at night, creating a cooling breeze through the villa. Outside: The villa has its own private garden, large patio and roof terrace. You also have access to many acres of beautiful gardens on the rest of the complex (which is maintained to a very high standard). On the complex you also have access to six different pool areas the nearest of which is 20m away and has a large main pool, a heated smaller pool and a shallow toddlers pool). There are 4 tennis courts, a gym, indoor pool, driving range and a 9 hole golf course. The main bar and restuarant for the complex is next to the main pool - 30m from the villa. Again - see our website (link below) for further details and pictures. Utility Room: Small utility room with washing machine and tumble dryer. Cleaning / Towels / Linen / Maid service: All towels and bed linen are provided (you just need to bring tea towels). The Villa will be cleaned before your stay and a daily maid service is available if required - at an extra charge. Hi. We are glad that you had a good time in the villa and that you loved the resort it is on. Thanks for your feedback. We are planning to make further improvements to the villa over the winter and hope that you will visit it again soon. I have stayed in several properties on Balaia Golf Village and this was by far the nicest. It has lots of space , both inside and out. The private garden and roof terrace were great for sunbathing, while the main pool and bar/restaurant was only a few yards away. Inside the open plan kitchen and lounge with large TV was ideal for evenings in. I also liked the fact that everything we needed , from supermarkets, to the beach, bars and restaurants was within easy walking distance meaning that we did not have to hire a car (I do enough driving at work, so appreciated the break). All in all it is a great place to stay and we will definitely be back. It was lovely to arrive and not be disappointed. The villa was an ideal base. The bedrooms were a good size, open plan living room and kitchen which was equipped with everything you need. It was great having a restaurant a few minutes away. The staff that work at the complex were all very helpful and courteous. I would definitely go back.. Thanks for the feedback. We try and make the villa a home from home, so we are pleased that you liked the villa and had a good time. You are welcome back any time. 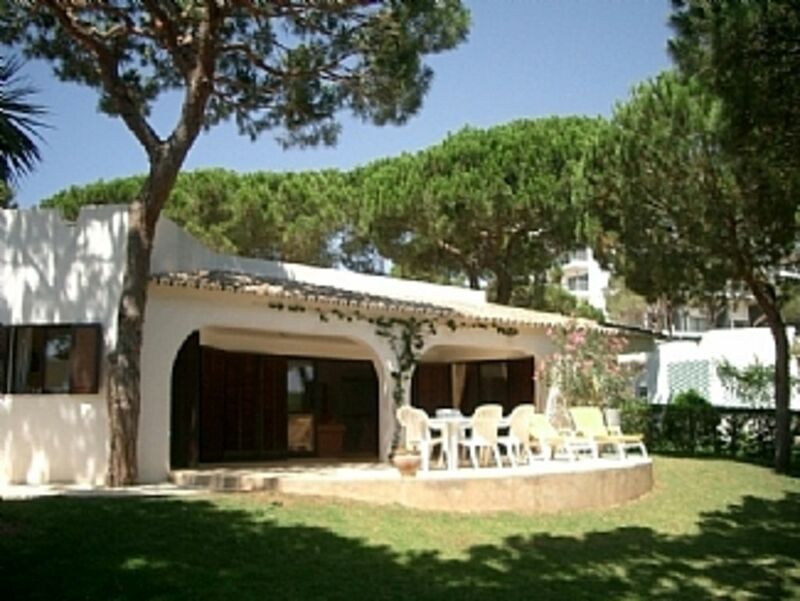 The villa is nicely and conveniently situated within Balaia Golf Village and was spacious enough for six adults. It had its good points but we wouldn't call it "luxury". It is one of the older original villas on the site and needs a bit of time and money spent on it to fix a few wear and tear problems. We have provided feedback to the owner so hopefully he will address these in due course. We spent the previous week in a villa in Vilamoura which was, without a doubt, luxurious and this, I'm afraid, didn't stand comparison. Thanks for your feedback after your stay. We have indeed spent time improving things and I am sure that you will not be disappointed if you choose to stay again. We have stayed in Balaia Golf Village previously but not at this villa. We had a lovely week, the villa was very well equiped and is in a great location for the main pool, restaurant, reception and a short walk to the nearest shop. We would have a stroll to the shop every morning for fresh croissants for breakfast, they make a lovely coffee too! The resort is beautiful, clean and well maintained and the reception staff are always very helpful. They booked a number of taxis for us to get to nearby restaurants and a day trip to Zoomarina, a must if you have small children. The resort itself is gorgeous, spotlessly maintained and perfectly suited to families. We loved all the pool/café options. Villa 8 was the ideal base for our 2 families together (2 couples + 2 2 year olds) with plenty of space for us all. We were all impressed by the quality of the facilities & décor of the villa (cbeebies on the tv for the kids was a godsend!) I can’t remember the last time I found a holiday to be so completely relaxing and hassle-free (this was partly down to the amount of info we received in advance from the owner, Richard)We will definitely return to Balaia resort again & hopefully this villa! The villa is only a short walk from the nearest beach (about 10 mins down a safe and quiete road/track). The beach is clean, safe and has beautiful golden sand (see picture below). There is a new beach cafe, which provides lunches, drinks, ice cream and cold bear etc. It is also open in the evening - and it is a delight to sit with a cold bear watching the sun set - or eating a meal of sardines or tuna steak etc. Kids meals are available - and the kids can play on the beach after the meal. The villa is just 30 mins from Faro airport. We can arrange a private transfer from the airport (31 euros for up to 4 people or 49 euros for 4+). ALternatively we can recommend a good car hire company, who will provide the car at the airport, or will deliver it to the villa for you. A hire car is not essential, as everything is within walking distance or a short taxi ride away (there are 3 small supermarkets within 3 minutes walk and a larger one just a mile away - with taxi rank outside. The villa is about 15 minutes walk (or 2 mins in taxi) from the small but lively fishing village of Olos de Agua in one direction and an area known as 'the strip' in the other direction. The strip is an area on the outskirts of Albufeira with hundreds of friendly bars and family restuarants. The famous old fishing twn of Albufeira itself is about a mile further on - about 5 minutes in a taxi. Search Google Earth using 'Balaia Golf Village, Abufeira, 8200' to see exact location. The Balaia complex has a 24 hour reception. They are always very helpful and will be happy to help you with directions, or can book taxis and local restaurants for you. The on-site restuarant is located next to the main pool near the villa and provides excellent lunches and good value evening meals. Tnternet access is available in reception using three web-terminals , or wireless access is available in reception and in the main restuarant/bar area. Booking Notes: The villa can sleep up to eight, but that includes at least one child in a cot (which we provide free of charge). We require a 25% deposit at the time of booking, with the balance being due 8 weeks before departure. We can take payment by credit card, cheque or bank transfer. Changeover Day: We are happy to be flexible about changeover dates. Please contact us to discuss. Notes on prices: We just require a 25% Deposit- which you can pay by Debit or Credit card. The Balance is due 8 weeks before your stay. Discount available for 2nd week of a 2 week stay. Prices are in Pounds Sterling, but we will also accept payment in Euros.